I have been trying to experiment with grain free pastas lately. I first made my Zucchini Pasta with Avocado Pesto. That was a huge hit, so I thought I would try spaghetti squash next. That is how this Spaghetti Squash with Pesto Sauce was born. Now this pesto sauce is different. It is made with hemp oil . If you haven’t had hemp oil, you should give it a try! Not only is it healthy, it has a very nice nutty taste! Spaghetti squash is super easy to make. No spiralizer needed! It is very naturally very stringy, so you just need to scoop it out once roasted. A super healthy, low carb, grain free pasta option! Brush the squash with oil and lay face down on a lined baking sheet . While the squash is roasting. Make the pesto. In a food processor , combine all the pesto ingredients, except the water, and mix well. Slowly, 1 tablespoon at a time, add water until you reach a desired consistency. Once the squash is done, use a fork to pull out the spaghetti. Toss the pesto on top and serve immediately or refrigerate for later. This dish should last about a week in the fridge. The pesto sauce may be frozen, but I am not sure if the squash can be. Thanks for sharing! I follow them already. Great recipes! I am always looking for different options for spaghetti squash and never thought about pesto. Sounds delish!!! Nutritional yeast just adds a nutty and cheesy taste. People either love it or hate it. I really love it. It's also loaded with b vitamins and fiber. Nothing like bread yeast at all. This looks brilliant - I love squash! I am thinking of trying out nutritional yeast - it is true it has a good 'cheesy' taste? I think it does. Kind of cheesy and nutty. will be trying this soon!! i love spaghetti squash and recently made the life changing decision of healthy eating. so I'm giving this a try! I just have to say that I LOVE all of your recipes. Last year I discovered clean eating and since finding out how great it makes me feel, I have used so many of your recipes to keep me sane! I have tried really hard to cut out refined sugar and you have so many great alternatives. Thank you so much! You are so welcome Christine! The pesto was great! However, the squash turned out very soggy and mushy. I'll need to make some adjustments. I'm sorry that happened. Did you use the squash right away? :( If it was stored, maybe some more liquid leeched out? 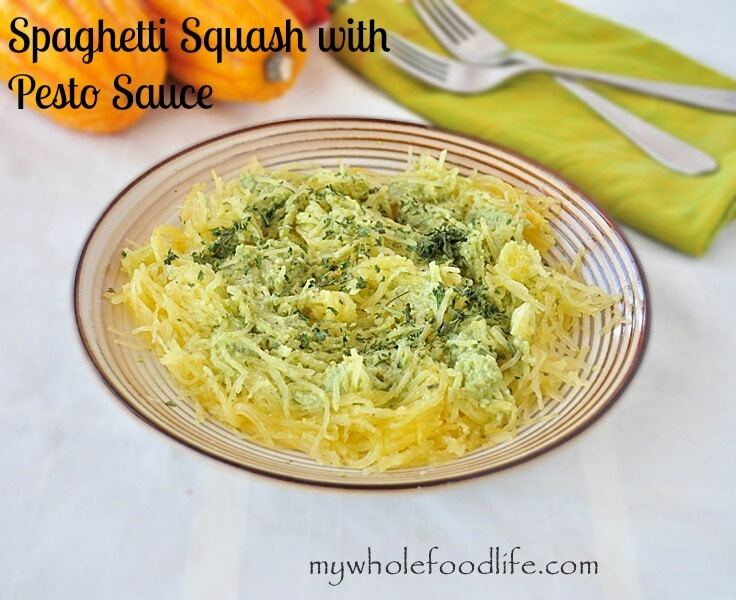 Pingback: Spaghetti Squash with Pesto Sauce | Healthy Recipes and more! Is there something I could substitute for Hemp oil?? Since having to change my diet I don't have space for all the specialized gluten free items..Help! Is there another oil that would be a good substitute for the hemp? You can probably use olive oil. 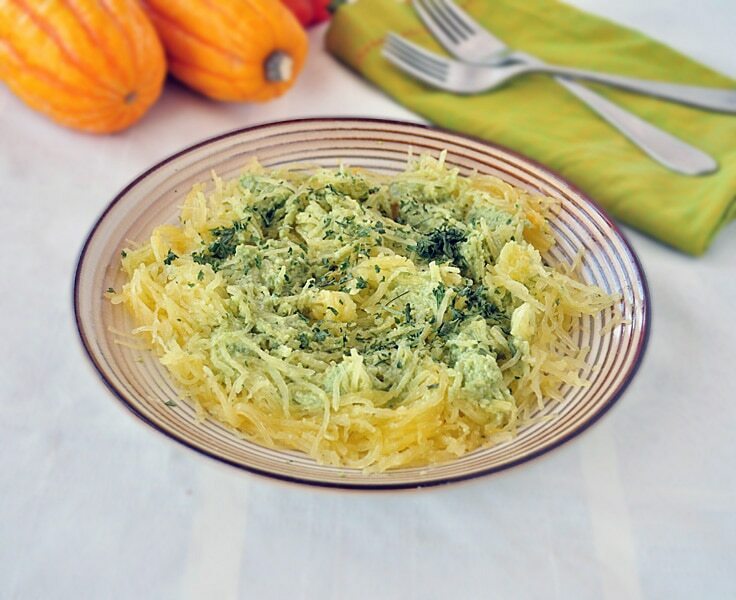 I love your recipes and can't wait to try the spaghetti squash with pesto! I will probably substitute olive oil for the hemp oil. I'm assuming the oil is just for the squash and not to be put in the pesto sauce, correct? Lovely recipe. Yes you can freeze spaghetti squash.